Plants remove atmospheric carbon dioxide. Plants and substrate release water vapour so humidifying the air. Airborne pollutants are deposited in the substrate, on the leaf surfaces of the plant layer, and onto the moist internal surfaces of the leaf and therefore remain on the roof and do not transfer to the stormwater system. Air borne heavy metals are absorbed onto plant and substrate surfaces. A range of organic volatiles including formaldehyde, xylene, toluene and benzene are removed from the atmosphere. Large scale roof planting will reduce the “urban heat island effect” and improve the flow of cool fresh air around the city. A green roof cannot replace a ground-based habitat for the complexity and diversity of species supported. However, some provision of natural areas for wildlife can be sustained through the use of green roofs. 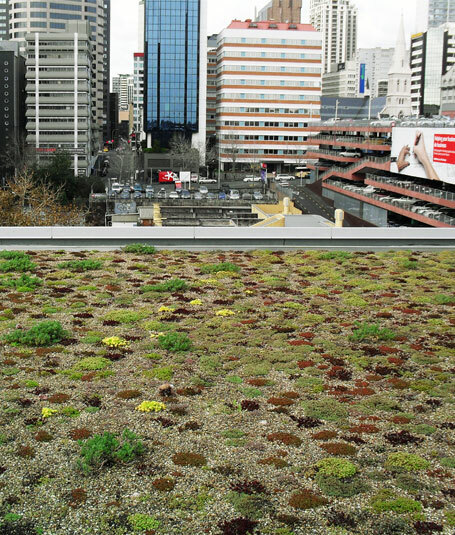 For certain species, green roofs could provide habitat stepping-stones in the city environment where any protected habitat is becoming increasingly island-like in nature. They are free of predators – the main culprit being the domestic cat. They can be constructed to cater for selected species. The type of vegetation being used on the roof could be designed specifically to encourage animal species to colonise it… for example, within the UK, the provision of bare areas for nesting and plenty of small areas of short vegetation has encouraged the return of the Black Redstart. This bird species is considered endangered in the UK but has been found colonising green roof space in South East England.